Salesforce users can add visibility into the current engagement state of a prospect within Outreach. These fields contain information about the current active sequence that is engaging the prospect, including the sequence state, sequence step type, when the next sequence step is due, and the who is assigned to the activity. You'll need to add new Type fields to the Lead/Contact Layout with the correct Field Level security settings. Once the engagement panel is set up in Salesforce, the Salesforce admin can update the Outreach plugin mappings with these fields. As prospects move through the sequence, the values will change and push to Salesforce. To add the field mappings in Outreach, go to the SFDC plug-in, select the type (either contact, lead, or both), and select the fields tab. On the top right corner of the page, click on the “add” button to create a new mapping. On the left side of the mapping, select the Outreach prospect field. On the right, find the corresponding Salesforce Lead or Contact field. Select the “update out” checkbox and save your changes. Refresh the page to view the new mappings. With these mappings, Outreach will push the sequence data into Salesforce for each prospect, constantly updating the data as the prospect moves through the sequence. Note: These fields will not be updated until the prospect moves forward in a sequence. Once there's a change to the prospect profile in Outreach, the engagement panel information will sync to Salesforce. If you'd like to force update these fields, you can manually sync records with Salesforce. If you're using a checkbox to show whether or not a prospect is active in a sequence, you need to include additional settings on your engagement panel. In the Salesforce plugin, navigate to the object that has the "active in sequence" checkbox. This is most commonly on the lead and/or contact. Hover over the field and click on the dropdown arrow that appears on the right side of the page. 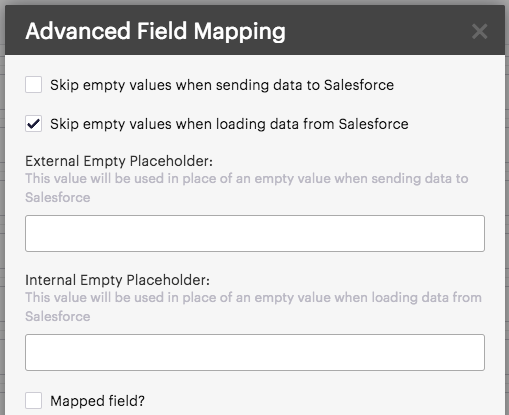 Select "Advanced"
On the pop-up box, uncheck the option to "skip empty values when sending data to Salesforce". This allows Outreach to push a false value to Salesforce, unchecking the associated Salesforce field and updating the prospect profile to show they are not active in a sequence.